When I say Australia, I don’t mean the semi-successful Baz Lurhmann musical featuring Nicole Kidman and Wolverine, I mean actual Australia. Or the act of colonizing it to be precise. This is what Durance, the new indie role-playing game from Jason Morningstar, is all about. Here’s the premise: the future has too many delinquents. They aren’t bad enough to murder, but too irredeemable to reprogram. So the government has a genius idea of putting them all on a ship and sending them to some far flung planet in order to settle it and, hopefully, in the future it will generate profit. As all government plans, it’s executed badly and people on the colony face starvation and other difficulties. If you’ve read my previous post, you know that I’ve facilitated this game at Indie Con 2012. I’ve done it with minimal preparation – the plan to run it came together only the day before. I’ve read the rulebook once, and whilst it seemed like I had a pretty good grasp on the concept and rules, I was still a little unsure of how it would all play out (if at all). But this is a general feeling I get with all indie games, and they always work out so I worried needlessly. Here’s what it’s all about. You start by completing a planetary survey and a colony record. Passing a leaflet around you mark things that you think are true or false about the planet and colony, then you pick a unifying drive, such as status or control, for example. You create a list of notables, characters representing the social strata of the power-ladders for Authority and Convicts and give them oaths, things that they swear to never ever do. Then everyone spends some time fleshing out the details and voila, you have yourself a planet, a colony and some characters, all ready to participate in a story that is played out in scenes, much like Fiasco. The difference though is that one player is always the guide, and his notables mostly don’t participate in scenes (a rotating role). Instead, she asks a formulated question that should help other players decide what the scene is about, what notables participate, and how the oaths might be pushed towards a breaking point. Whenever there is uncertainty in the scene, some dice are rolled to determine which drives take precedence and the scene is played out accordingly. It’s all very clever but I kind of don’t really want to get into the mechanics, they’re there, in the book. If you wanna find out more – go and get it. It’s great. I really want to talk about my personal experience of playing the game, expectations, outcomes, etc. So, when you hear the phrase ‘the new Jason Morningstar game’, you instantly think: the new Fiasco!, right? Well, as you’re reading the book, you quickly realize that that simply isn’t the case. It has similarities yes. In both games you spend some time creating an ensemble of characters and then play out scenes to determine their fate. That’s about as close as it gets though. Whilst Fiasco has a unifying theme of corrupt characters, it’s genres are broad and settings nearly limitless. 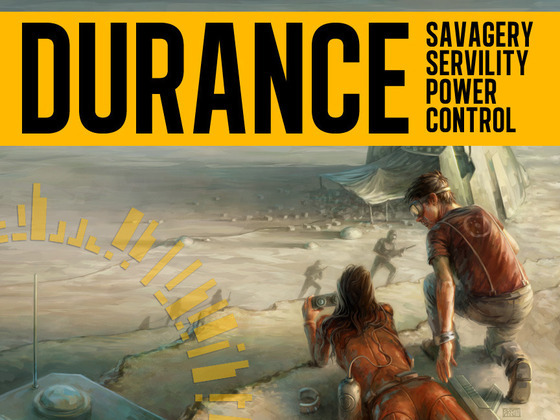 Durance is what it is, space colonization with convicts. My other three players weren’t familiar with Durance at all. I explained the rules for the setup and off we went creating our planet and colony. The book said it would take about fifteen minutes. The book lied. It took us over an hour. Yup. Over an hour. Which is great really. And I imagine that the setup time decreases as you become more accustomed to the game. We’ve ended up with an oil rich planet that ‘changes’ you if you spend too much time outside of the colony. The base itself was a strictly regimented authoritative nightmare that focused solely on expansion and food production was non-existent. Our Governor was a man who didn’t tolerate incompetence and the Dimber Damber, the dismissively named shadow criminal overlord, was deliberately slowing down all production. And the colony was naturally driven by control. The game itself mechanically is all about breaking oaths. As soon as a number of them equal to the number of players are broken, the game ends. And as soon as one is broken, the dynamics of the planet/colony/status/drives changes. The governor was the first to fall. After numerous incidents he stormed out to arrest the Dimber Damber only to find out that he couldn’t even do that. He tolerated his own incompetence long enough. He broke his oath. The colony fell under corrupt criminal control. Whatever was ‘out there’, started to seem much better. People started to leave. At the end of the game, most of the colony escaped, and the last scene was between the Dimber Damber’s lieutenant and the leader of the bolters, the mutated men and women who have adapted to the environment and became ‘something else’. Because players always get to establish what the scene is about before it begins, there was always a heavy amount of discussion. We usually dismissed the first idea that came to the table. The instinct was to dig deeper, find something a little more interesting. Whereas Fiasco games are ‘Yes, and’, this was more ‘No, but how about’. And then ‘no’ was usually targeted at self. As in, no, I can think of something better. Which is actually something I prefer I think. The gonzo aspect was almost non-existent. Instead we had hard-hitting drama in a tough environment. You can usually tell a good game apart in the convention by how much cheering and laughter there is. Ours must have looked like the dullest of them all. But we, the players, knew better. We were experiencing a gritty story and it had us captivated. Every scene usually ended up as a confrontation in dialogue between two characters. It would reach a certain point when we didn’t know which character should give in. We then rolled for Uncertainty (a game mechanic meant to move the game along and suggest options), and proceeded accordingly. If at any point two of the dice return with the same result, an event happens. Strangely enough, every time it happened in our game, the event was ridiculously apt for the current situation. I guess it was partly luck but probably some clever design techniques were involved in writing those events. The game ended fairly soon. I’d say the total playtime was around three and a half hours. I think we were conscious of the fact that we had a limited time slot and all pushed for a slightly quicker game, resolving character arcs fairly quickly. In fact, two of the oaths were broken in a single scene. A lag (convict) broke her oath of never trusting again when she was trying to escape the colony into the wilderness and encountered an unsure marine perimeter guard, who decided to break his oath of never going ‘out there’ and left together with her. Quickly the last scene followed, giving us a glimpse of the life outside and letting us know that the colony would never be the same again. And then the game just ended. We decided to narrate a little followup on all our notables, talking about their fates. And now I just want to find out what the next story is. What will our next planet be like? How will the power dynamics shift? Durance has me captivated and I simply want more.